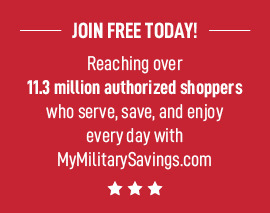 The holidays are upon us! Each holiday season, I love to bake, and my 5 year old loves to help whenever she can! When you have young kids, sometimes you look for simple and fun recipes that they will enjoy! 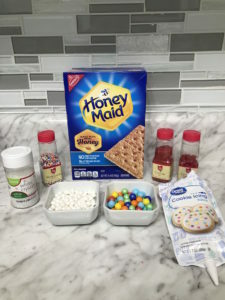 I was SO excited when I stumbled across this quick, fun, and creative NABISCO recipe! 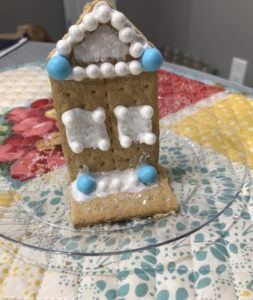 EASY HONEY MAID Holiday Houses, simple yet fun. Very few ingredients required and its great for family time! While decorating your family’s holiday houses, you can let the kiddos get creative and decorate their houses in their own special way! My daughter chose to decorate her house with purple and pink mini chocolates, and shiny pearl sugar beads. My husband, whose house is featured chose to decorate his with a “snowflake” theme in mine, blue and white! TRIM both corners off one end of each of 12 grahams for sloped roof of the house; reserve trimmed corners for later use. DECORATE houses with frosting and suggested decorations as desired. BREAK remaining grahams in half to get 12 graham squares. Stand 1 decorated house on each graham square, using 1 of the reserved trimmed corners for support and securing all pieces with some of the remaining frosting. LET stand 1 hour or until frosting is firm. Have fun with your kids making these holiday houses. As a bonus, they can also be used to help teach kids about portion control. For each chalet, cut 2 graham crackers in half to get 4 graham squares. Stand 2 graham squares against each other in an inverted V-shape on parchment-covered baking sheet, attaching them at the top with frosting. Cut 2 corners off each of the remaining graham squares with serrated knife to fit the front and back of the chalet, securing pieces with frosting. Decorate with frosting, candy canes, other candies and sprinkles as desired. Let stand several hours or until frosting is firm. 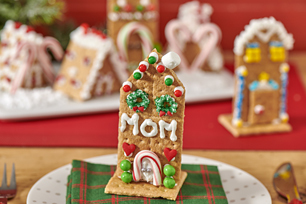 Use decorating icing to write names on fronts of decorated houses, then use as name cards on your holiday table.